When you have downloaded the App, there are two ways of creating an account – you can either push the CREATE ACCOUNT button or login with Facebook and follow the instructions. After pushing the CREATE ACCOUNT button, you need to enter an email address and a password. The email address will be connected to your account and will function as your user name when you log in. You can add a photo or picture by pushing the ‘+’ sign in the avatar and follow the instructions. There are also some personal user information that is required to create an account. Personal information such as date of birth, height, weight and gender will not be disclosed within the App or in any way be disclosed or made public, but the information is necessary when calculating the paceUP! points. Personal information and the photo can at any time be updated under Profile / Settings in the App. What does it cost to have an account? paceUP! is free and there are no cost or charges associated with using the App or being a member of the paceUP! community. Why do you need my date of birth, weight, height and gender? Personal information such as date of birth, height, weight and gender will not be disclosed within the App or in any way be disclosed or made public, but the information is necessary when calculating the paceUP! points to make sure that you receive the right amount of points for your activities. There are three ways of logging an activity in paceUP! Track and log your activity by using the built in GPS on your smartphone, by pushing the orange plus-sign on the Leaderboard/Feed screen and push Activity. You start with choosing the correct type of activity or sport and then you are ready to go. Note that you can only track activities with a Distance with your built in GPS, other activities must be logged manually or by your Garmin device. You can also use your Garmin device to automatically push your activities to paceUP! All Garmin devices using Garmin Connect are compatible. Manually created activities in Garmin Connect will also be transferred to paceUP! You can connect your Garmin Connect account under Profile/Settings. After the connection is made and an activity is synced the last 30 days of activities will be pushed automatically to paceUP! This process can take 1-3 days. Some information in the activities that have been pushed from Garmin can later be changed if you want, e.g. activity type – a Cycling activity can for example be changed to Mountain bike to better reflect your activity, but also to give you the correct paceUP! points. How are the paceUP! points calculated? The paceUP! points consist of Base points and Effort points The effort points are calculated based on the effect and rate of energy consumption measured during the activity – taking your gender, age, bodyweight and height into consideration. You will be awarded 100 base points for every training session exceeding 30 minutes to promote frequent training. At least 30 minutes of moderate-intensity aerobic activity is associated with several health benefits. The calculations are based on Corrected MET values, derived from MET tables (Metabolic Equivalent of Tasks) for the activity performed. MET tables are an established and widely spread way of deriving the energy cost and they have been built through monitoring the oxygen consumption during various activities, to determine an average oxygen uptake per unit of time. The calculations take in to account all time and intensity measures recorded during your training session to award you a fair number of paceUP! points, regardless of activity. To promote recreational racing – paceUP! will award you double points if you participate in an official race. You will receive double points by setting the Activity Type to Race when you are tracking an activity. You can also change the Activity Type manually after the activity has taken place, or has been pushed from your Garmin device, by enter the activity in My Profile. Can I connect my GPS watch to paceUP!? You can connect your Garmin device to paceUP! and automatically push your activities to paceUP! All Garmin devices using Garmin Connect are compatible and manually created activities in Garmin Connect will also be transferred to paceUP! You can connect your Garmin device account under Profile/Settings. Once the connection is made and a first activity is synced the last 30 days of activities will be pushed automatically to paceUP! Be patient, the process can take 1-3 days. If you don’t have a Garmin, visit our web shop – we are an authorized Garmin distributor and offer great devices at great prices. We are currently establishing partnership with other brands, so be patient if you are using another device. We respect your privacy and you can decide yourself what level of details that you want to share with others. Under Profile / Setting you can set your privacy level and who you want to share your activities with. All users – you will share all activities and details with everyone. Other users can see your detailed activities and get inspired and motivated from your achievements. My friends – you will share your details with users that you have connected to as a Friend, other users can only see your activities and paceUP! points, but not all details. Only myself – you will not share any details with anyone, other users can only see your activities and paceUP! points. What is a paceUP! season? A paceUP! season runs over a calendar quarter which is equivalent to three months. During that quarter, the users collect points and gain or lose positions versus the other users. At the end of the season you will get a final season score and position after which the Season points are re-set, and a new season starts. Your cumulative or ‘lifetime’ points do not re-set and can always be seen under ‘My Profile’. How do I search for paceUP! Friends? You can search for your friends by pushing the search button under the ‘Friends’ section that you will find under Profile. Push the search icon at the top right hand corner and start typing the first letters of your friend’s name. If you cannot find your friend as a user of the app you can invite them to join by pressing ‘Recommend’ paceUP! You can send an invitation by SMS, e-mail, or through social media. Can I change a logged activity? You can only change certain elements of a logged activity such as ‘Activity’, the perceived ‘Effort’ level or ‘Activity Type’ (Training or Race). You can also change the name of the activity and add notes. You cannot change the duration or distance of a logged activity. If you wish to do so you will need to replace the logged activity by a manually created activity instead. If you wish to remove an activity you can easily do so by first swiping left on the activity you want to remove and then pressing the red ‘delete’ button. How can I create my own groups? You can easily create your own groups by pressing the GROUPS icon in the top left corner under ‘My Profile’ and then pressing the orange + button. Start by assigning a group name, uploading a group picture, deciding on a start- and end date and choosing a group color. When you have created the group, you can start inviting users. The users will appear in your group once they have accepted your invitation. Don’t worry, you can always go back and edit your group and invite additional users later. For how long can a paceUP! group run? You can decide on a start time from the day you create the group or pick a day in the future. The group will run for maximum one year from the date you create the group. When the group is about to expire, you will get a reminder and there will be an opportunity to renew the group for another period. What is the Race Calendar? The Race Calendar is a collection of interesting recreational races that can be found by pressing the icon ‘Races’. There is a toggle switch at the top where you can choose to view ‘Past’ or ‘Future’ races. By pressing the race you are interested in you will be taken to the registration page and can enroll as a participant. You can also add the race to your calendar by pressing the calendar icon. If you are missing an interesting race in the calendar please e-mail us on info@paceup.se. You can easily add a picture or change your profile by pressing the ‘settings’ wheel under ‘My Profile’ and then pressing the orange ‘+’ sign under the circular shape or picture. The procedure for adding or changing a picture for a group is similar. Go to ‘Groups’ under ‘My Profile’, chose the group you want to change, and press ‘Edit’ in the top right hand corner. You can now add or change the picture by pressing the orange ‘+’ sign. What push notifications will I receive? You can easily turn off the friend’s activity notifications by pressing the settings wheel under ‘My Profile’ and switching the ‘Friends activity notifications’ toggle to off. This is useful if you have many friends in the app and feel you are receiving too many push notifications. If you have further questions please do not hesitate to contact us on info@paceup.se! paceUP! is a mobile training- and recreational racing application. Real-life achievements are collected and visualized in a fun and user friendly way, using game mechanics and experience design. 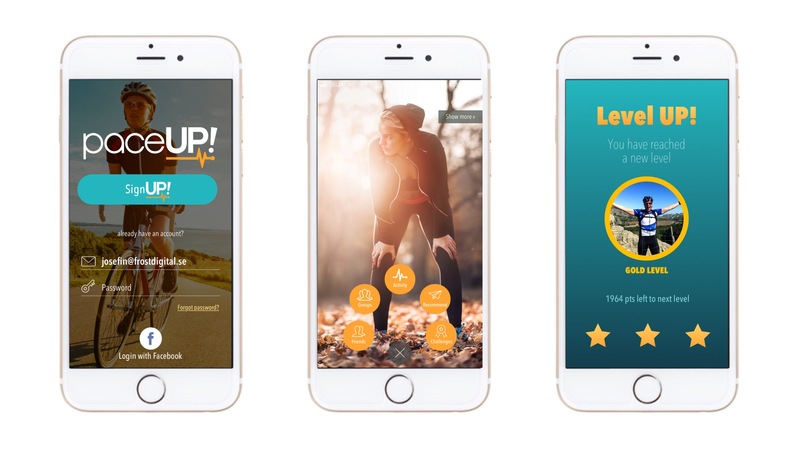 Users can log any type of physical activity and through our unique points system they can compare their progress against themselves and others. Walking, running, biking to work, or working out on the gym – everything counts! The concept works exceptionally well in a corporate setting where companies can activate their employees in a fun and user friendly way. 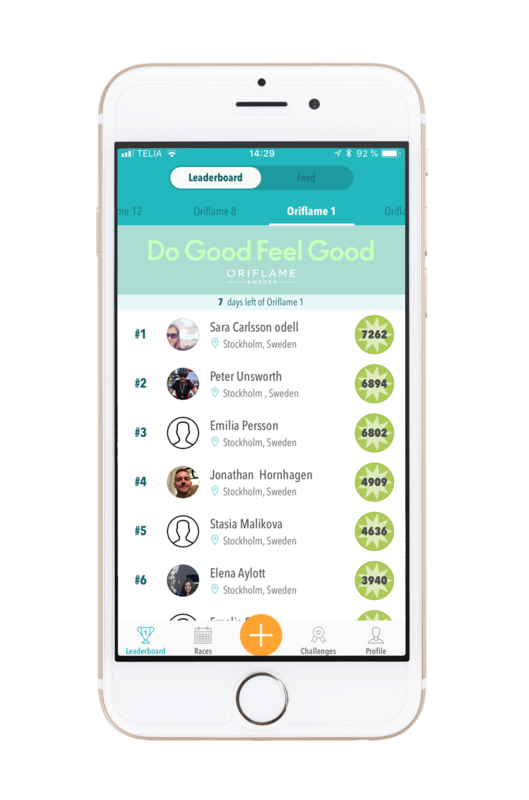 The ranking and placing are based on paceUP!’s unique effort points where any type of activity can be tracked and loged. The paceUP! points can the be directly translated to rewards, prices or donations. A web-based admin interface is provided to manage the funcationality and follow-up results. The length of the challenge is flexible anddecided by the customer. Regardless of how you log your activity – with your Garmin device, with GPS and the app on your smartphone, or manually in the app – you can always compare and compete with others!